Usually in stock to ship right away! The GSC300 can be programmed with our easy-to-use PC software interface (extra cost option) that allows customization of messaging; languages; sender selections; control settings; and much more. 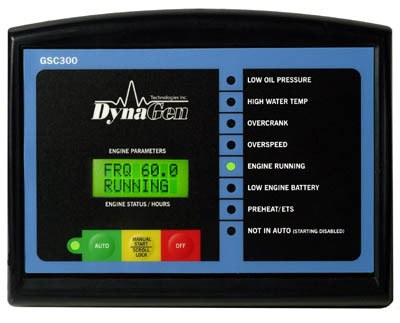 Or, for a nominal fee of $65.00, we can program this GSC300 for you to your custom settings prior to shipping. The choice is yours. The programmer pictured is NOT included in your purchase. If you do not request programming, we must assume you have a programmer or the factory settings are satisfactory! Programming cannot be done from the front panel. The GSC300 is one of the few engine controllers socketed to accept 3 industry standard 40 Amp cube relays - each protected by an easily replaceable automotive fuse. The GSC300 saves you time and money by completely eliminating the need to mount, wire, and fuse external slave relays for Fuel, Crank, and Preheat. Another industry first from DynaGen! For 24 volt systems you simply replace the on-board 12 volt relays with optional 24V relays. (Takes 3 relays). The most astonishing thing about the GSC300 is that it delivers so many features and savings in such a compact and attractive high-impact ABS plastic housing. And, its patent pending design provides you with a solution that costs less than most conventional autostart units! All this comes with DynaGen's standard 5 Year Warranty - the best in the business. Rectifier Power Module for Onan 305-0675, Kohler GM28483, etc. This quality mag pick-up has 3/8" fine threads, 2.5" long. Has 6 foot shielded cable attached.